Let's get ready to rumble, etc. WASHINGTON -- Fox News has not yet announced who will grace the stage Thursday night in Cleveland for the first GOP presidential debate. But given the most recent polls, we have a pretty good idea of which candidates will make the cut. Fox has said it will average the most recent five polls from "major, nationally recognized organizations that use standard methodological techniques" to create a top 10 field of candidates who will participate in the coveted 9 p.m. primetime debate. Depending on which polls Fox takes into account, it's possible that the final list could include ties, resulting in more than 10 candidates onstage. Contenders who don’t make the main stage will be given an opportunity to debate each other at an earlier, 5 p.m. slot. Most notably, it’s looking like former Texas Gov. Rick Perry will be on the latter, so-called “kids' stage.” The three-term governor has failed to break out during his second run for the White House, although he led one of the reddest states in the country and has one of the best job creation records in the crowded field. In recent weeks, Perry has more or less staked his campaign on being the anti-Donald Trump. He has lambasted the real estate mogul more forcefully than any other candidate -- particularly on the issue of veterans, in the aftermath of Trump’s comments disparaging the war service record of Sen. John McCain (R-Ariz.). As the only Republican presidential candidate with substantial military service, Perry would have been uniquely positioned to attack Trump on the matter this Thursday. He may end up doing so anyway, but chances are he won't be doing it to Trump's face. Perry’s slump could also have to do with to the presence of another successful executive, Ohio Gov. John Kasich. The Ohio governor, who supports Obamacare’s Medicaid expansion and is running on the mantle of “compassionate” conservatism, announced his intention to run for president just two weeks prior to the debate. His late entrance appeared perfectly timed to land him a spot on the main stage, pushing past Louisiana Gov. Bobby Jindal and former governors like Perry and George Pataki of New York. As of Tuesday morning, the five polls Fox is most likely to use are from Monmouth University, NBC/The Wall Street Journal, Fox News itself, Bloomberg and CBS/The New York Times. Averaging these five polls gives Trump a strong lead with 23.2 percent support. Former Florida Gov. Jeb Bush is a distant second with 12.8 percent support, and Wisconsin Gov. Scott Walker is nearby with 10.6 percent. After that, five candidates are clustered together within a narrow range: Ben Carson and former Arkansas Gov. Mike Huckabee each have 6.6 percent support, Sen. Ted Cruz (Texas) has 6.2 percent, Sen. Marco Rubio (Fla.) has 5.2 percent and Sen. Rand Paul (Ky.) has 4.8 percent. New Jersey Gov. Chris Christie and Kasich, who are polling with 3.4 and 2.8 percent support respectively, could be the final two candidates to make the main stage. 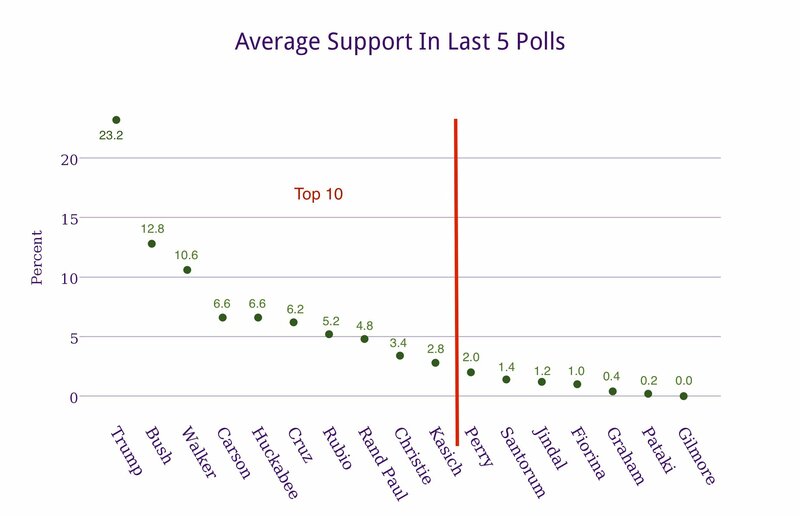 Perry, meanwhile, has just 2 percent support -- but this puts him within the averaging error. Taking into account the differences in the five polls used to create the average, it could be that Perry has a shot at the 10th slot. Nearly all the candidates got an opportunity to test their pitches Monday night during a candidate forum at Saint Anselm College in Manchester, New Hampshire. But the strict rules of the event -- each candidate was given just five minutes to take questions -- left several of them struggling to articulate a coherent message or stand out from the pack.